The Neilo range of machines has revolutionised the basic Tractor Grader design and offers a sophisticated package on a new Kubota tractor. 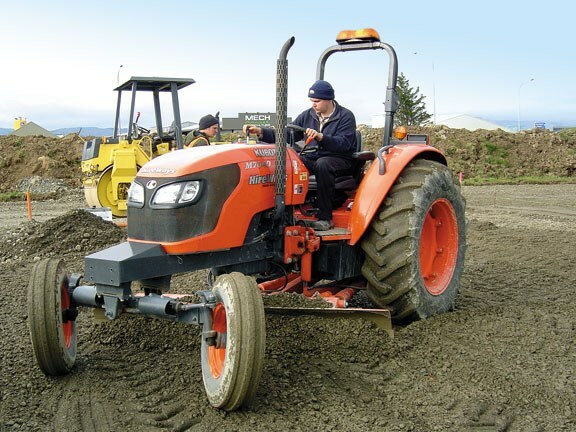 The Neilo Tractor Grader starts as a basic Kubota M7040F tractor before getting thoroughly re-engineered. 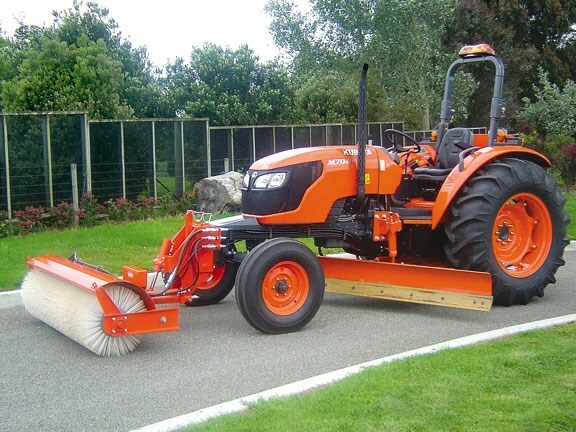 Neilo Tractor Graders are manufactured by Neil O'Fee Equipment, and start life as a standard Kubota M7040F two-wheel drive tractor. Engineers then build a longer, heavy-duty chassis to lengthen the tractors wheelbase by about half a metre, and the front gets lifted to increase the ground clearance for the mid-mounted grader. The company says having a longer wheelbase allows the blade to be angled further to help shift the material sideways and also gives more clearance between the fully angled blade and the front wheel. The original plastic diesel tank is replaced with a purpose-built tank to allow more room for the blade. A creep reduction box is added to the transmission giving a total of 12 speeds to choose from. The specially-built grader blade has all the features of a full-sized grader including angle, tilt, crowd and sideshift, and all these functions are hydraulically-controlled. The Kubota M7040F is fitted with a four-cylinder 3.3-litre diesel engine delivering 70hp to the transmission with a synchromesh shuttle. 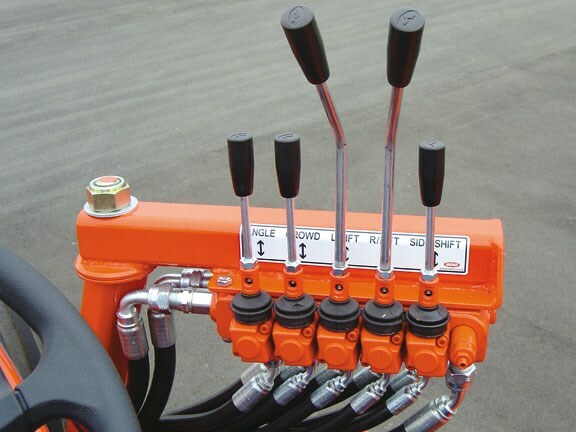 A 64.6 litre-per-minute hydraulic pump supplies oil to operate the three-point linkage and grader blade. If the optional front broom is fitted an additional hydraulic pump is mounted via a three-to-one setup box onto the power take-off. This pump has its own hydraulic tank and oil to ensure it doesn't overheat the tractor's oil during long periods of sweeping in hot conditions. The broom is fitted with a quick hitch and can be easily removed by one person in a few minutes. 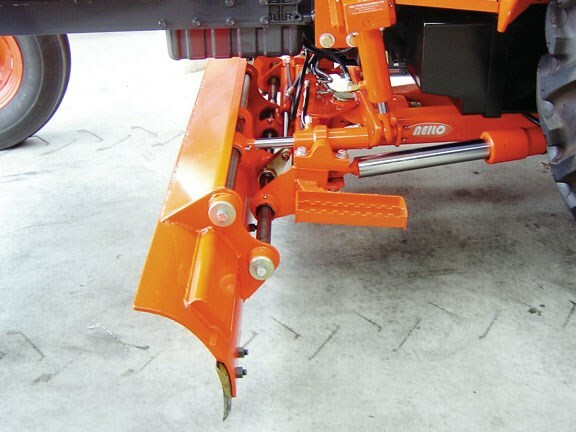 The grader blade has a width of 2.4m and can be angled 25 degrees each way. Some 390mm of sideshift is available and there is 200mm of ground clearance under the blade when fully lifted. Five levers control the blade functions: angle, crowd, left lift, right lift and side shift. The designers have managed to squeeze the blade and all its functions into a small gap while retaining maximum ground clearance. 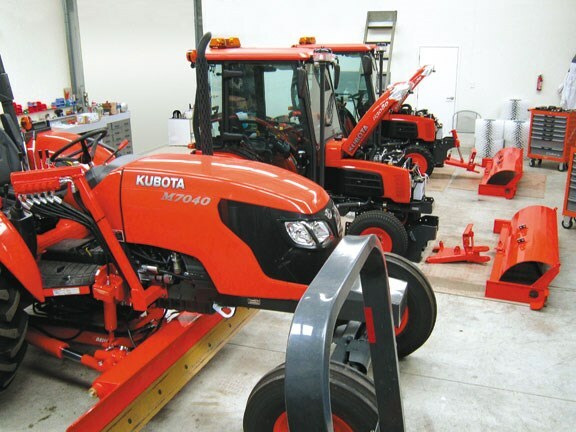 The company builds all the machines on Kubota tractors, and says "they are very reliable and because of their design they are an ideal tractor to modify for this application." 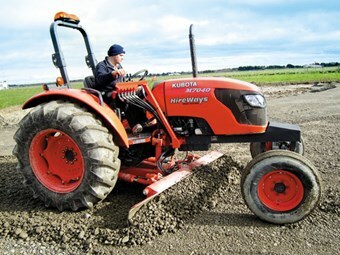 Norwood's is the service agent for Kubota and it has dealerships throughout New Zealand so the tractors can be serviced anywhere. Even after Neilo's modifications the Kubota tractors are still backed by their factory warranty. Neilo engineers build all the required parts. After painting they are delivered to the assembly workshop where Neil personally assembles all the tractors. The Kubota M7040F Tractor Grader or Tractor Grader/Broom combo is the main grader, but if a grader/front-end loader combination is required Neil can stretch a four wheel drive version of this tractor to facilitate the safe fitting and operation of the loader. I was surprised at how easy the Neilo grader was to use and I quickly got the results I was looking for. Two features of the grader stand out. The first is that when the blade is fully crowded back at ground level it can be angled through its 50 degrees of movement while staying on a level plane. So you can be grading along and angle the blade to dispense some material without the ends digging in as the blade slews. The second feature is the hydraulic crowd; when the blade is crowded forward it lowers down as it pivots. 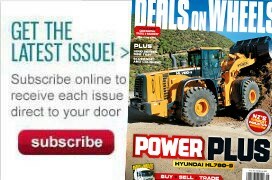 So when I set the blade crowded half way forward I could drive along pushing some gravel and as I approach a low spot, I simply crowd the blade back to allow some gravel to drop out, and the opposite when I encounter a high spot - I can lower the blade with one smooth precise movement. As I'm grading I can use the side shift to manoeuvre the blade around obstacles and it is great at shifting material into the corners of the site. After the excavator has roughly spread the gravel around in another part of the site I use the Kubota to grade the base into shape. Some underground services had just been buried so there were some soft spots in the gravel. By applying the right brake pedal I was able to assist the tractor around. The site was fairly tight and this is where these tractor graders come into their own - a compact size and great manoeuvrability, yet rugged enough to handle demanding tasks. 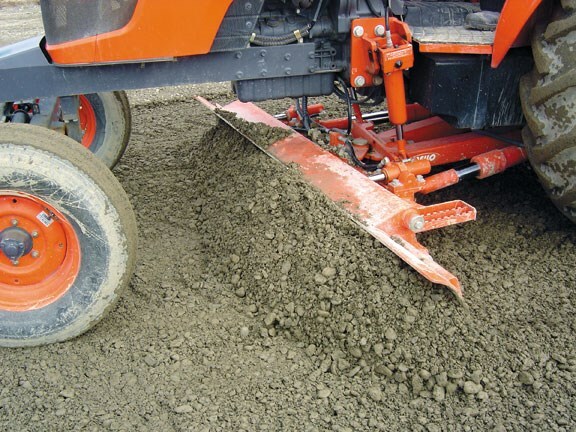 The grader blade has a great shape to it and can shift a lot of material. It rolls the material along instead of just pushing it, so the tractor is working less to shift the same amount, saving diesel. For delicate grading I found it comfortable to either stand or sit, both give good visibility of the grader blade and all the controls are within easy reach. The hydraulics are smooth to operate and very small movements can be achieved. With the addition of the creep reduction box there is a gear for every application. I was impressed with the ease of handling. It is a beautiful piece of engineering, has excellent grading characteristics and all the features required to make life easy for the operator. Neil takes great pride in his machines and this is reflected in the finished products and the after sales support. It is great to see quality Kiwi-made products being built.